It's clear with pumpkin spice EVERYTHING all around us that summer is almost behind us. I decided to use that as an excuse to make a fun summertime sangria. For my ChristmAugust party lots of people showed with with bottles of wine, one in particular, a Moscato. If you've never had Moscato, it's a sweeter white wine. I used to drink it when I was new to drinking wine, but now it sort of makes me cringe. I decided it would be perfect to use in a sangria though. 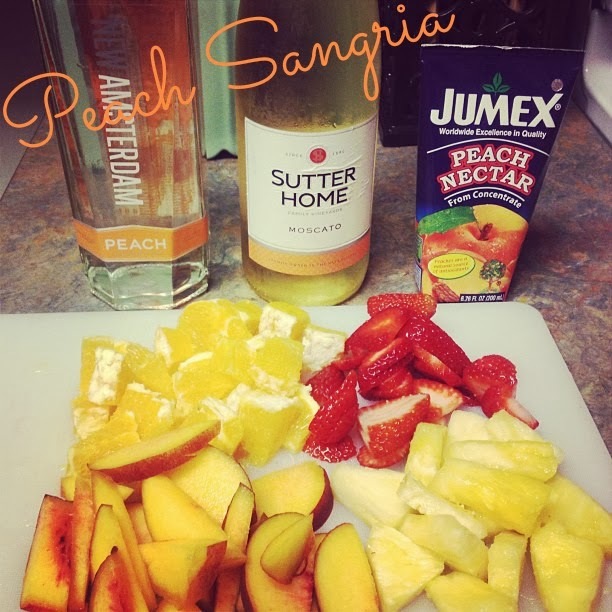 So I scoured pinterest for a yummy (and easy) sangria recipe and I found a peach sangria recipe. Mix all your ingredients together, stir, and let it sit overnight for the best flavor. I WILL say the Moscato, true to form, turned out a bit overpowering in the sangria and using a different white wine would probably be better BUT I basically used the Moscato just to get rid of it. Haha. Sangria is fun to make and even MORE fun to drink with friends. So get out there and make some summertime sangria of your own before summer is over!